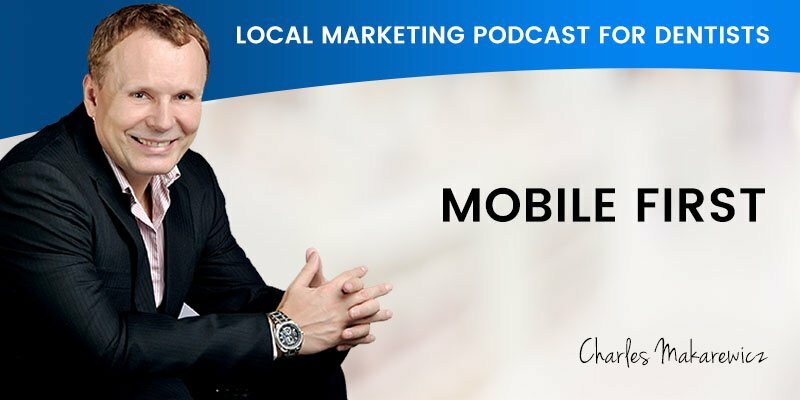 Scott Edwards and Charles Makarewicz discuss “Mobile First” and its relevance to your Dental practice. Scott: I’m Scott Edwards, and today I have Charles Makarewicz with me to discuss “Mobile First” and its relevance to your dental practice. Charles is the founder of Dental Marketing Expert, a company which specializes in local marketing for Australian dentists, and is responsible for many dental practices across Australia dominating their local competition and attracting up to 15 new patients each and every week. Welcome to the show again, Charles. Charles: Thanks for the introduction, Scott and good morning everyone. Scott: Today Charles, we’re here to discuss “Mobile First” and its relevance to your dental practice. Charles, can you explain to our dentists listening, what exactly is Mobile First? Charles: Okay. What is “Mobile First”? Mobile First is preparing yourself for the future, preparing yourself for what’s coming including what is here right now. Number one is, how do you look at it? How is your dental practice looking in the Mobile First? What are you thinking about it? What do you think is important? How can you prepare yourself for that? I think number one is to start thinking about your web development and your website as the Mobile First. 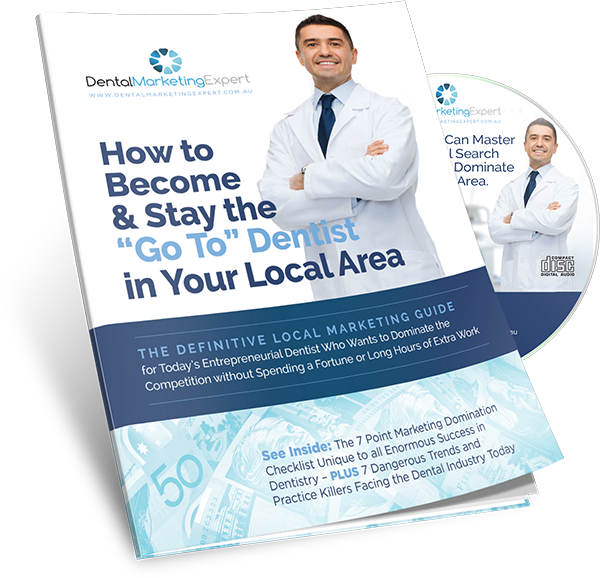 A majority of dentists will look at it and ask for the website design from a desktop perspective first. Well, that’s not right. That’s not current. We’ve been doing this for many years, and things have changed. You’ll have to change your thinking. Change your thinking how this website is consumed. And it’s consumed on mobile. We don’t need lot of graphics. We definitely don’t need the big sliders. We don’t need all that stuff on the desktop. It needs to be really simple — simple call to action, good information like your address, opening hours, click to call, some specials, and about us. Those critical information need to be on the mobile. And we don’t need a list of 30 little treatment snippets on the mobile phone. Because that will be scrolling and scrolling for five minutes and no one will ever get there. It’s a different concept. It’s minimalistic concept on the mobile. In trying to get your head around it, I think the good place to look is social. All the social networks are now mobile. They’re on the mobile phone, and they’re mobile first. So think about how Facebook thinks. How do you access Facebook daily? We access that on the mobile phone primarily. You look at other platforms like YouTube, Instagram and LinkedIn. All of those social platforms, they’re already mobile first. And when we’re doing this podcast, I went and searched for podcast recordings, and search engines, and I could not believe there are so many platforms out there which only offer mobile. They don’t have a proper website for browsing. They don’t have any concept of desktop. There are simply two options when you go to the website: download app for Android phone, or download app for iPhone. And you’re thinking, “Oh, yeah, but I want to do some search in desktop.” Not available. That’s the future. This is where everything’s going. So please try to put your head around it, that mobile first is really thinking mobile, thinking everything is being consumed on the mobile phone. We looked at five to six years back in the other areas which we investigated, and we found out that mobile bookings, were pretty low. About 10% of the booking requests for a dentist were from mobile. This is completely reversed now. Over 50% of the bookings are now from mobile phone. We have a proof, and not just statistics from somewhere or a theory online which isn’t 100% proven. It’s us. We actually got the data directly from our clients. We know that more than 50% of dental bookings are coming from mobile. This is exactly the line of thinking that we have in our agency – everything is mobile. So what can we do to improve clients’ exposure on mobile? What can we do to build a better system so our conversion improves on mobile devices? This is how you should be thinking about it. Have a look at all your digital assets. How are they displayed on mobile phone? When you’re working on your Facebook posts, please have look at it. Is that displayed on mobile correctly? Is it only published on a desktop, but wasn’t checked on the mobile? When we produce all our content, every single thing is checked on the mobile. We look at the mobile first, or at least look at them at the same time. We never ignore it. We never do everything desktop first and then try to modify to mobile. Things like graphic design, sizes for social media banners to promote your business, your dental practice, branding, have to be customized for a mobile screen. I’ve seen a lot of Facebook and Youtube pages, which you thought should have been customised to mobile. But no they’re not. They’re customized to desktop. Your text only looks beautiful on the desktop, but terrible on mobile. Everything is cut. It’s just half a message there. I think dentists will benefit from thinking mobile first in every single aspect of online marketing. Every single aspect of building the asset like banner designs, should be they done correctly. I guess that’s so easy to overlook. This is really critical for us, moving forward. This year alone, the mobile website has been indexed first by Google. Google is already telling us that there is no going back. Two to four years from now, I think desktop will be negligent. Why we as a marketers are pushing so hard to mobile is because that’s where the patients are. That’s where your money is. That’s all. This is based on facts. It’s not a theory so please take this to heart. Scott: You mention Google’s indexing update that came through a few months ago, Charles. How does the indexing for mobile differ to that of indexing based on desktop? Charles: If we look at Google itself, it’s super-smart. It’s an artificial intelligence, which pretty much, runs this whole show. Google knows all about us. It gets a huge amount of data. Google looks for user experience. For them to dominate the search, they have to give the best results for the user. They know that if you’re on the mobile device and there’s a two to three second pauses, when the website hasn’t loaded, you’re going to leave. They can see it, you leaving those websites and going to another one. You prefer the ones which load in under two seconds or under one second. Google doesn’t want to give a bad experience for the searcher. So they implemented an algorithm which penalizes you for slow website. When your website pages loads slow, you are going to drop in ranking. Google won’t put you at the top. The put at the top are very fast, very slim, with a really good experience mobile websites. Scott: What do dentists need to do to make sure their website is up to speed and provide user experience that Google wants to provide to its users? Charles: With regard to the website, there are a few things you can do straight away. You can talk to your developer and ask them to test it. Make sure it loads under two seconds. If your website loads three to four seconds, you have a problem. Five seconds, you definitely have a problem. In this case, you talk to your developer, and ask them what they can do to improve the speed. Do you need to redesign the website? Is the hosting an issue? Lots of times, when you have an American host, you add additional one second to your speed. So, you can simply change your host to improve your mobile first experience. Further, things like a lot of heavy images to create a pretty responsive website, can cause a penalty. That’s additional one second just for loading heavy images, loading sliders, especially. Your developer can just go and remove some of those sliders, and use a code just for mobile devices. They can slim down the website to load in mobile. That will shave the time and improve your conversion. This is not always recommended in the long run, because every time you have a new content, you have to pay developer to update it. We recommend a different approach to it. You can talk to us, and we’re happy to explain to you what systems we develop internally to avoid the high cost developer time by doing everything manually. Charles: Yeah, perhaps you’re right, Scott. We haven’t seen it much. We have new clients coming onboard with existing websites to prove your point. Scott: What’s the real answer for a dentist who is not a web expert? They can listen to what needs to be done and pass on information. But how can they guarantee that they will get what they need? Charles: You can talk to us. We obviously implemented the system over six years ago. Where other websites are responsive, we have been doing the exact same system for so many years, and it works. It generated bookings to our clients. As a result, our clients are dominating on the mobile. Yes, please talk to us. We’re happy to show you what system we run and how that can be implemented. Scott: What’s the best way for someone to contact us to get to talk to you, Charles? Charles: Well, firstly, you can go to our website, DentalMarketingExpert.com.au/call. You’ll be routed to booking appointment page. You can request a 15-minute triage call with us. We will review what your current digital assets are. We can look at your mobile first experience to check on what you have and what you don’t have. We’ll help you create the blueprint to implement and to basically win the game in mobile first. Scott: Is there any obligation on that call? Are you going back them into a corner and sign them up to a contract? Charles: No. There’s no obligation. We’re here to help you and see if we are a good match. If we can help you, you can work with us, or you can simply take this blueprint and implement it yourself. Scott: Again, the website, to book a call with Charles, is DentalMarketingExpert.com.au/call. We’ve covered a lot of information today on quite a short podcast. But in our next episode, we will talk about the dental website, the components of a dental website, and what is and what isn’t required. So keep an eye out for our next podcast, which should be in the next month or so. And in the meantime, thanks for joining us. Bye for now.